Ashes Cricket is the officially licensed video game of cricket's greatest rivalry. Bringing all the fast-paced action, big hits and skill that you see in the greatest cricket competition on earth, in both a more realistic and authentic way than ever before, you'll be able to bathe your team in glory in the men's and women's 2017/2018 Ashes tours. Courtesy of Big Ant's unique photogrammetry technology, Ashes Cricket presents official photorealistic likenesses for all of the Australian and English men's and women's teams - it will make you feel like you're right there at the live game. Star Test players have been fully motion-captured and you can choose your own batting or bowling style to make your game your own. Big Ant's most detailed and refined cricket engine to date allows for true 360-degree batting. No two players will play the game the same way! One game will probably last longer than those useless feckers down in Australia. most boring game ever made, coaled. Don't buy it then, if I was after a review I'd look at Metacritic or IGN, however this site is for cheap deals.... can you find it cheaper? Seems to be dropping price every week. Cheapest so far so heat added. Time for me to ride off into retirement sunset! Is this just a re-badged Don bradman cricket? I wasn't impressed with that one. Is this just a re-badged Don bradman cricket? I wasn't impressed with that …Is this just a re-badged Don bradman cricket? I wasn't impressed with that one. Sort of, yeah. But it's a lot easier than that, if you wish to play on easier settings that is. Definitely more accessible. Thanks for your input, I'll definitely be trusting the opinion of someone who can't spell "cold". This or the Don Bradman Cricket 17 ? Are there only two teams in this game. ? ‌ This or the Don Bradman Cricket 17 ? 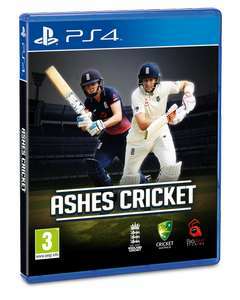 Both are made by the same company, only difference is that this basically includes the Ashes license, apart from that I believe they are the same. You may want to Google to double check though. Only 2 are licensed. The other teams have fake player names but you can edit them I believe. ROOTed out a good deal, just down my MOEEN ALI. should keep me going for a few WOAKES until new year, less to COOKing and going aBROAD. Whilst this isn’t obviously high end, I’d love to know which early PS2 era games you have been playing.